BrightTouch is an All-In-One (Android Powered) Touch-screen /Signage system. Plays images, sound and video by playlist. Plug & Play USB media input. 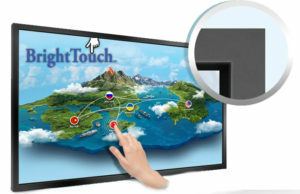 Supports 6 Point Multi-Touch from internal engine or external media device. Includes: Remote control, AC power cord. VESA wall mountable. USB input for external PC media devices.